Took this photo this morning, the dawn of our last full day in the United States. After a four-week vacation, we will depart San Francisco Friday afternoon en route to Bangkok. In this photo, Tawn curls up on our friend Anita’s sofa with a Cafe Bustelo au lait. There is plenty more to share from this trip – heck, I’m still blogging about Maui and we left there nearly two weeks ago! – so stay tuned over the coming weeks. 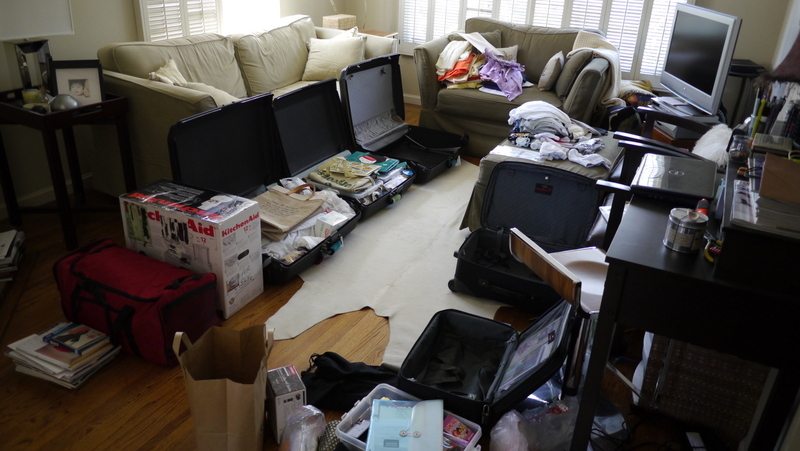 Later in the afternoon, the living room turns into our staging area as we pack our bags. While it may seem like a lot for two people, we’re actually returning with my sister and brother-in-law in tow. They will each have a bag of their own and then will help us carry this extra luggage. A Costco run this morning concluded the shopping list with bulk amounts of almonds, pecans, and maple syrup. We also purchased a Kitchen Aid food processor, which sells about about $450 less here in the United States than in Thailand. I love the idea of traveling light, but there are too many things that we can get here (or get more cheaply) that we would be foolish not to carry as much back to Thaliand as we can. Was it sad to leave San Francisco or were you happy to be departing for Bangkok? I admire your logistical prowess with your packing! It is mostly chaos in our household when we are getting ready for a trip. Wow. That is a lot of stuff! Safe travels! Next time you come to CA, to Orange Co. we should have a meetup. I know your time is compressed. You must have a checklist. I think you have this down to a science. That’s a great picture of Tawn. I thought he was sleeping but still holding on to his coffee. Just looking at all the bags and the packing that is being done, I perspired into an anxiety attack, almost! Four weeks flew by so quick! Now back to the Bangkok heat again. Don’t you guys miss the States? I can’t believe the food processor costs so much in Thailand. Have a safe travel and have fun with Jen and Kevin! @RakkaRay – Good question Ray. I haven’t missed Bangkok in the least. At the same time, I’m not sure I would want to live in SF again. Nice place to visit but a bit provincial. (And I use that word after great thought…)@CurryPuffy – We certainly miss friends in the US and there are aspects of things in cities here that we don’t have in Bangkok (think the charming, walkable neighborhoods of NY or SF). That said, I think it will be a number of years before we consider moving back. @ZSA_MD – I’ve been breathing deeply… trying to hold back panic. @slmret – Yes, the packing is just about done and Friday morning I may run to Costco for another pack of nuts and maybe one more jug of maple syrup. Will weigh the bags first to double-check how close we are. @Ricardo98 – That would be fun. Not sure when we’ll be back in the US next, but am always interested in meeting other Xangans. @ElusiveWords – He wasn’t sleeping, just resting his eyes. Yeah, often do use a checklist but this time there’s just too much stuff. Instead, I moved everything into the one room and packed from there. @murisopsis – Sure is… but much of it will be cooked when we return. @Fatcat723 – Thanks! @yang1815 – We certainly will. Looking forward to the adventure. Thanks again for everything in Maui and Omaha; we’ll miss you and Sugi! tawn looks so fragile and peaceful in that sofa. hope he didn’t spill anything while dozing off. That’s a very nice photo of Tawn.When you buy the food processor in the US it has a different plug and might even run on 110AC. How do you use it in Thailand? @AppsScraps – Thanks… can’t wait to take it for a spin. Sorry, couldn’t help myself. Yay for Costco… but I’m sad that you’re already heading back to Thailand 😦 I wish there wasn’t school keeping me from meeting you. oh my, you bought a kitchen aid and are flying back with it? hahaha i totally understand though, i love my kitchenaid! @Devilzgaysianboi – Yes, it is a shame our schedules didn’t coordinate. Tawn and I will be back in SF again… we always return. @kunhuo42 – It was almost $450 cheaper to buy it in the US. Can’t see paying that much of a premium to buy it in Thailand. $450 is a massive difference. That’s insane. Well, I hope it isn’t too much of a hassle to bring back home. Have a safe and wonderful flight back, thanks for indulging us on your foodadventures stateside. Tawn looks exactly like me in the mornings after the kids go off to school. Except I don’t have a cup of coffee since I would definitely fall asleep! haha! I am SO jealous of your Kitchenaid purchase. I totally want one too! But there is no space in our kitchen and it is so expensive to buy one here too. I’m looking forward to reading about your creations with your new gadget!